Just when we were getting used to Mobikes a new bike share company popped up. 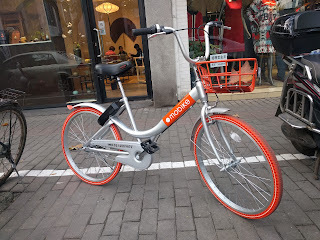 We like them already because they didn't copy the Mobike color. This is just outside a train station, you can see a whole bunch of old mobikes (orange) and several of the new ofo bikes (yellow). Another reason I like them: they chose the actual name of their company because the English characters "ofo" kind of look like a guy riding a bicycle. The Chinese written language is "logographic" and the visual look of the character sometimes is related to the meaning. I think it is great they are doing the same with the Latin alphabet without asking permission. 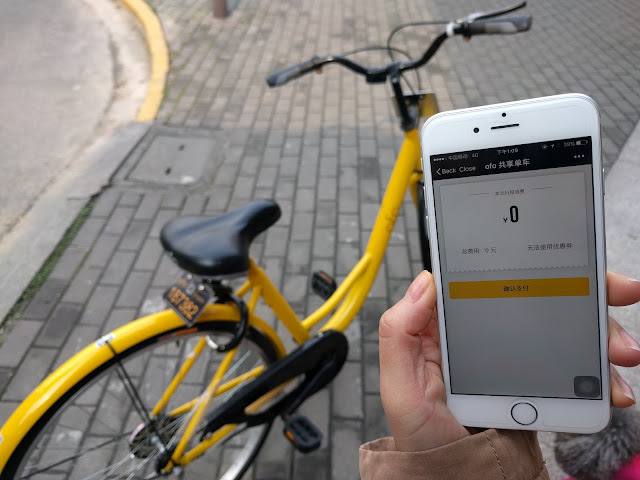 But the best thing about ofo bike is that they invented a bike you can leave anywhere and unlock with your phone ... that doesn't have any electronics! No GPS and no network connectivity of any sort, meaning they can pump out a huge number really cheaply. How do they do it? 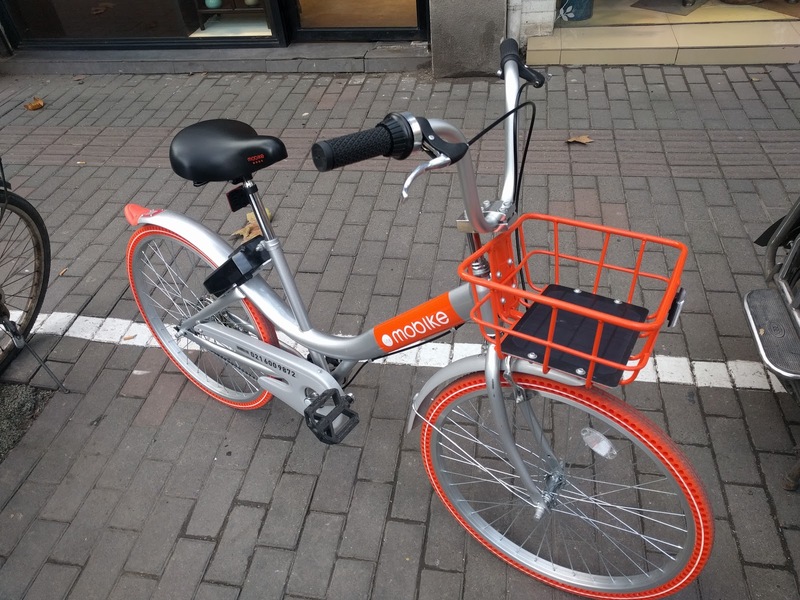 The first difference from mobike is the lock, it is an old-school mechanical combination lock. When the code is right pushing the button unlocks the bike immediately. Like mobike, manually closing the lock locks it again. 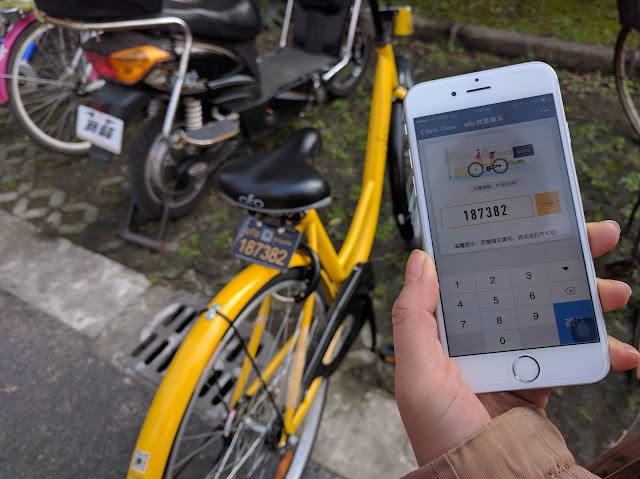 You use the app to get the combination lock code by punching in the license plate number of the bike. When you start riding it keeps track of your location and tells you how far you went. 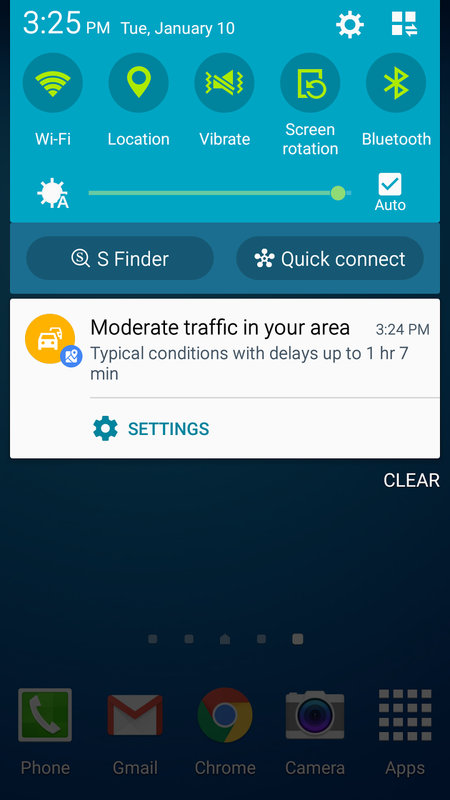 When you tell the app you are finished riding - it used the GPS on your phone to estimate where the bike was left. 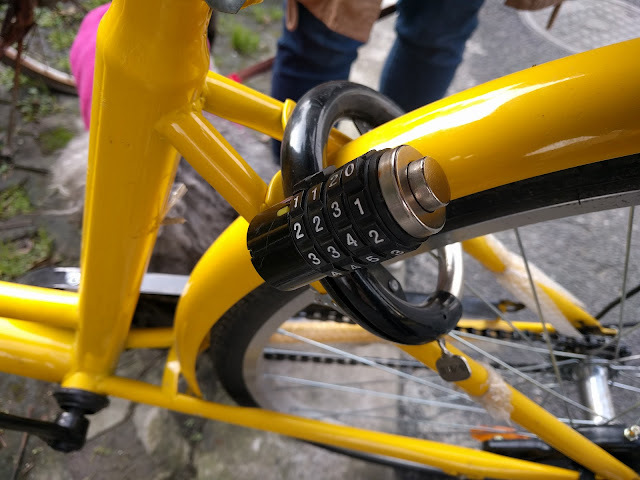 You are on the honor system to lock the bike and scramble the combination. Naturally this isn't as accurate as having GPS built into the bike ... but they have made so many of these cheap bikes that you really don't need the app to find one ... they are everywhere. 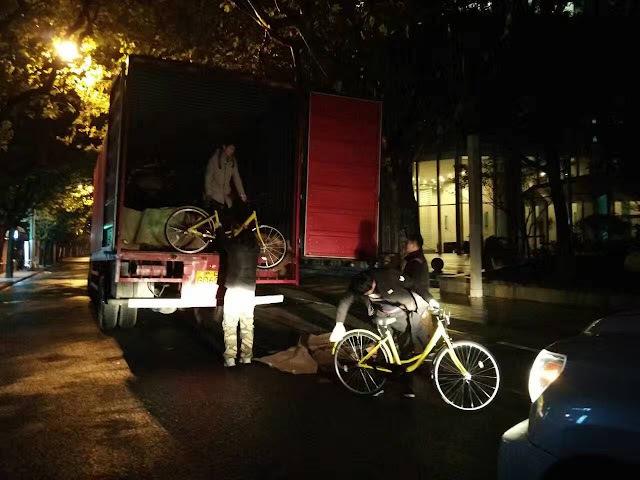 Literately dropping them off the back of trucks all over Shanghai. 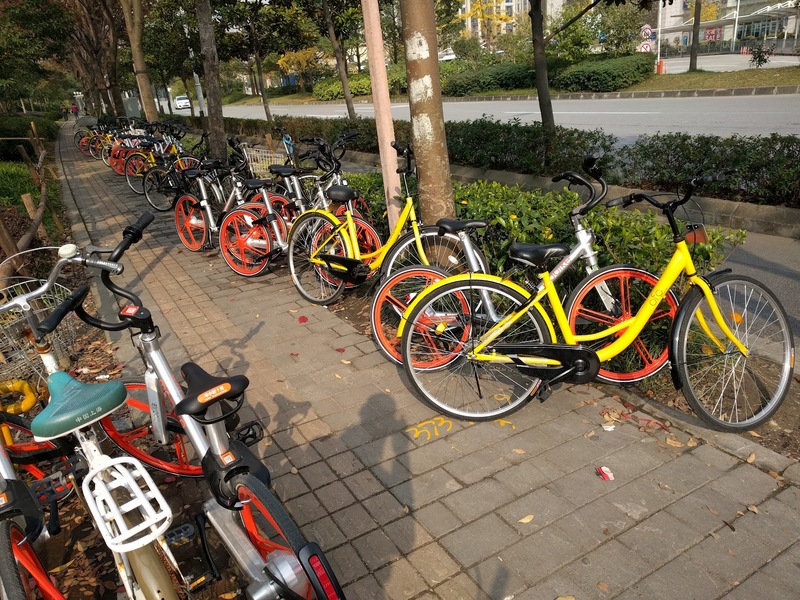 They ride fairly nicely - though like mobike - their seat is too low to be comfortable on long rides. 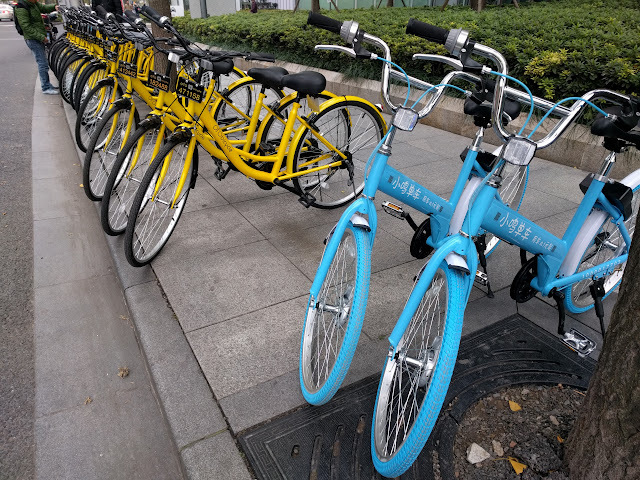 And guess what ... another primary color has been taken over by yet another public bike network. This one doesn't have any English options, and I'm not in Shanghai anymore so we'll have to leave it a mystery. Footnote on Chinese logography: The word bird 鸟 kind of looks like a chicken looking to the right, the word for "big" 大 kind of looks like a man with outstretched arms and the word for "fire" 火 kind of looks like a man waving his arms like he's on fire and also kind of like a bonfire. 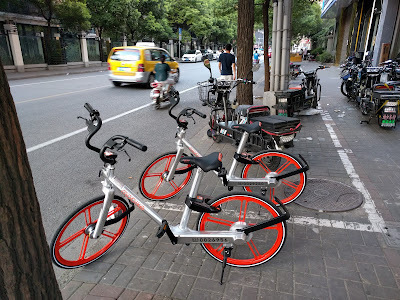 In August I wrote about the really cool Chinese GPS enabled public bikes MoBike – well since then there have been a few developments. 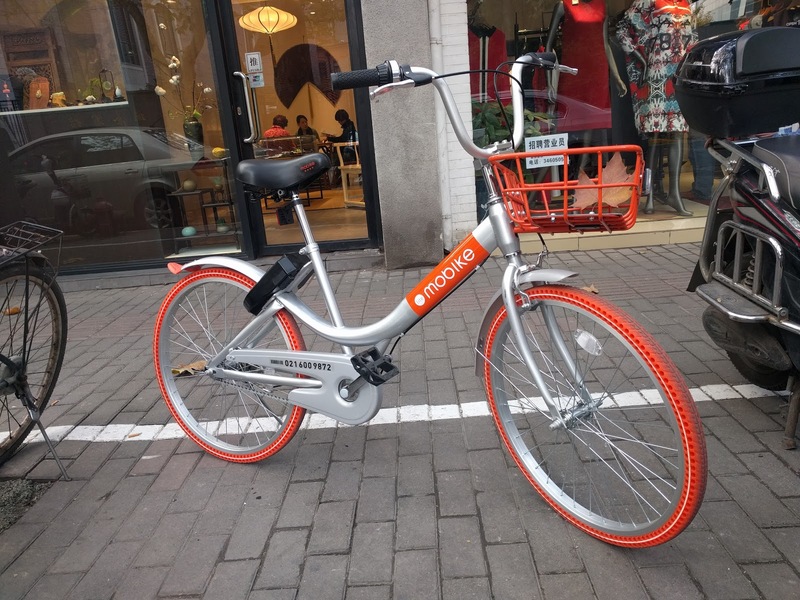 First, Mobike backpedaled on their super-unique industrial design and made something that looks more familiar like a bike. The bike is lighter made from normal metal tubes instead of what appeared to be solid aluminum in the old design. 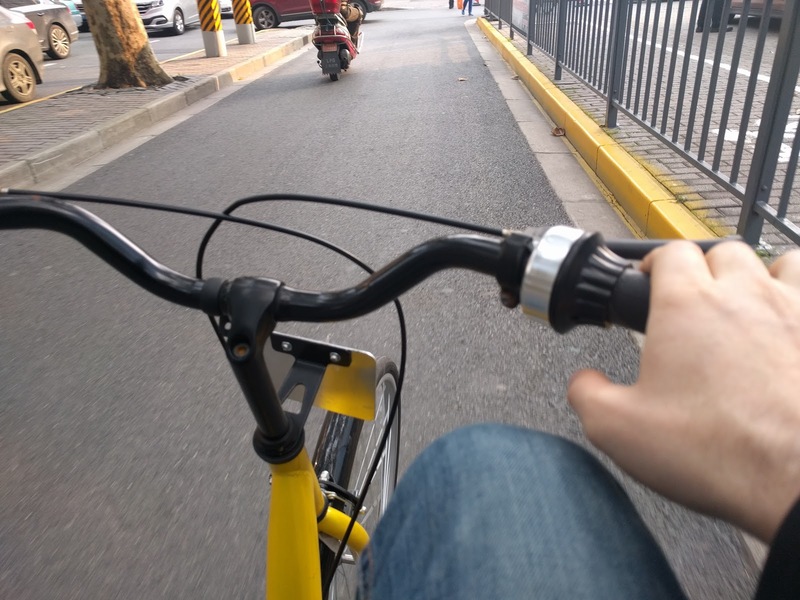 The wheels are light with normal spokes, and instead of solid rubber tires, they tires have these little air-holes in them to add some bounce. 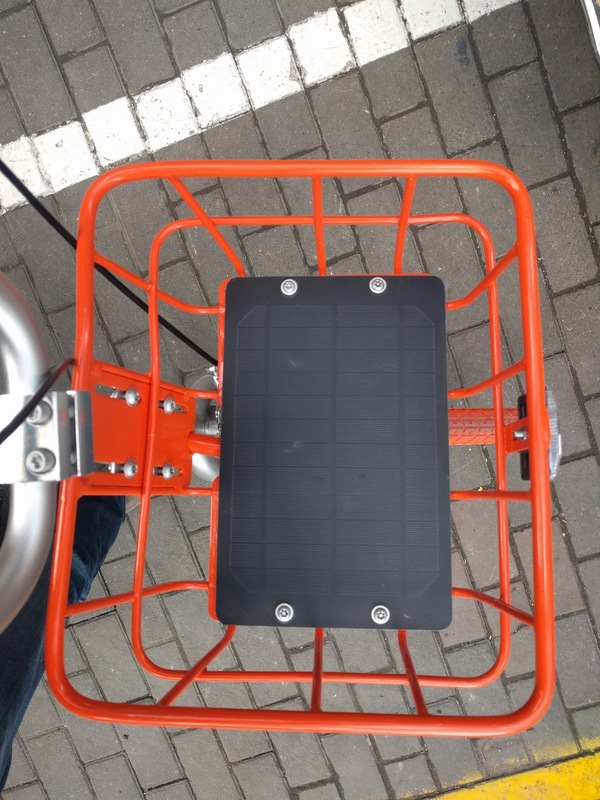 One particularly cool development is that rather than a hub-mounted generator - they use a solar panel integrated into the new basket. 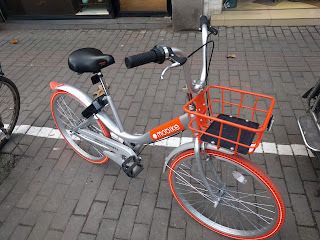 For reference, this was the old mobike design. Google is truly amazing. 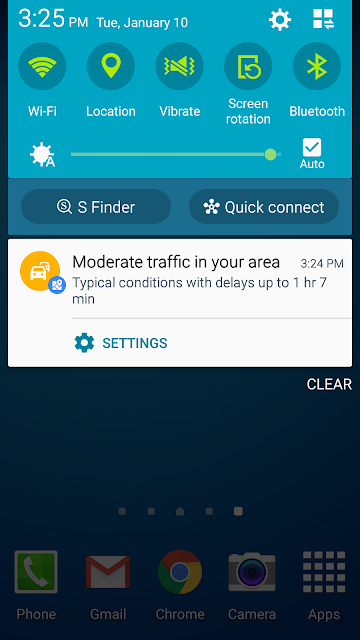 Their apps give you the ability to moderate traffic in your area and access to traffic settings with the tap of a finger! Our daughter’s name is Shoshana Ruth Lansey -- we call her Ruth. She is named after Stacy’s Oma (Raizel) Ruth Heidecker and my Grandma (Raizel) Rose Lansey, who both had the Jewish name Raizel, which is Yiddish for “rose” -- Shoshana in Hebrew. Both of our grandmothers were incredibly strong-willed women, each in their own way. Stacy’s Oma was a woman of strong faith, even in the face of great adversity, and managed to always find the good in people and make new friends at all stages of her life. We hope that our Ruth shares this strength of character and positive outlook. My Grandma truly believed that she -- and all of her children, grandchildren, and great-grandchildren -- could do anything we set our minds to, if only we tried our hardest. We hope that our daughter shares this confidence and work ethic. The name Shoshana Ruth also has strong historical connotations. The biblical Ruth was also a woman of profound faith. She took action when needed, which ultimately led to rise of King David. We hope that our Ruth will share the biblical Ruth’s immense faith in God and commitment to His people. Additionally, in an allegorical interpretation of Shir Hashirim -- the Song of Songs -- the shoshana is generally understood to represent the Jewish people: “Like a rose amongst the thorns,” God states, “are my nation amongst the others”. Ruth was born on the 11th of Tevet, the day after (and I recognize this is difficult math) the Tenth of Tevet, a fast day in the Jewish calendar, which commemorates the beginning of the siege of Jerusalem in the times of the First Temple. It is our hope that Shoshana Ruth will contribute towards the coming of a time where the 10th of Tevet will be, in the words of the prophet Zecharia, “לבית־יהודה לששון ולשמחה ולמעדים טובים” -- “occasions for joy and gladness, and happy festivals”, when “Shoshanat Ya’akov tzahala v’sameicha” -- “the rose of Jacob [in context: the Jewish people] rejoice…” once again.